This strange stare causes the opponent to run into the wall. 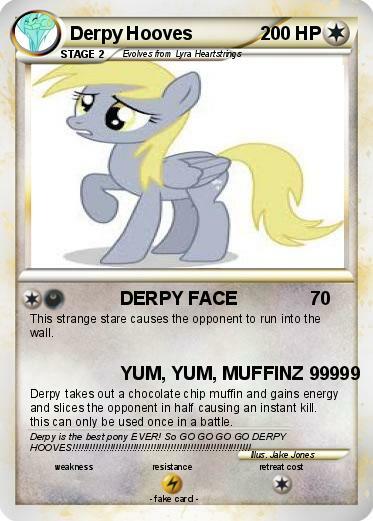 Derpy takes out a chocolate chip muffin and gains energy and slices the opponent in half causing an instant kill. this can only be used once in a battle. Comments : Derpy is the best pony EVER! So GO GO GO GO DERPY HOOVES!!!!!!!!!!!!!!!!!!!!!!!!!!!!!!!!!!!!!!!!!!!!!!!!!!!!!!!!!!!!! !